A Montana variant from the 1980s. Fish love Montana nymphs when fished slowly along the bottom of a lake bed. In the cold of winter and the heat of the summer fish those deep holes. Tail : Tip of marabou feather. Body : 3 strands of peacock herl. Thorax : Orange seals fur. Wing case : Black feather fibres, shine side up. 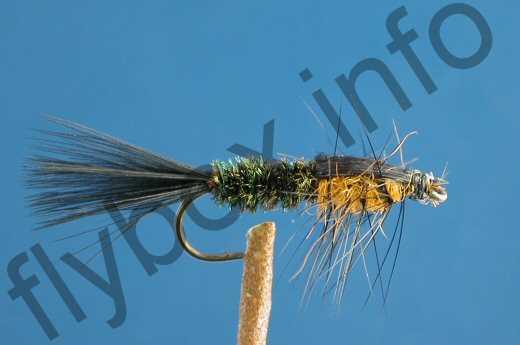 This fly can be weighted 6 to 10 wraps of lead wire a 1/4 back from the eye. Currently there are no comments about the Orange Peacock Montana fly pattern from other fly fishermen yet.